Make summers shine with the incredibly stylish and 100% comfortable Kumba ankle strap sandals for women from Birkenstock. 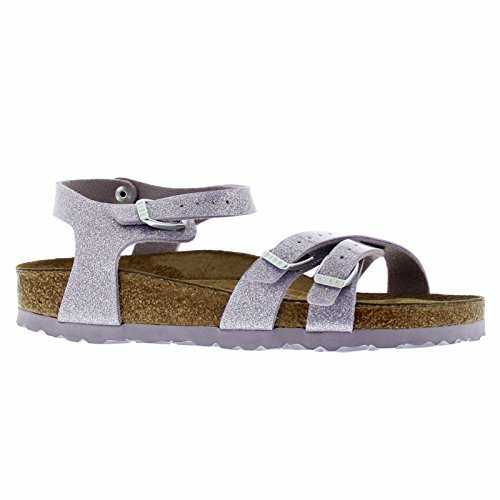 These lavender slide sandals are made using the exceptionally skin-friendly and hard-wearing synthetic material Birko-Flor upper with a three-layer composition allowing the glittering protective coating to sparkle and shine giving these classic sandals an elegant and stylish look while ensuring durability. These eye-catching strappy sandals feature three adjustable straps with sturdy metal buckle closure to easily get that perfect fit. The underside of this high quality upper material is lined with exceptionally soft and smooth layer of fleece while the anatomically correct natural cork-latex soft footbed encourages foot health. The suede lined contoured insole features a foam layer insert and moulds to the shape of your foot to cradle and support each and every step you take. The neutral heel profile and deep heel cup of these sandals is distributing your body weight more evenly maintaining a natural posture while walking. Finishing these narrow fit sandals is the lightweight and flexible EVA outsole with bone profile which offers shock absorbing support and lasting durability. Made in Germany.